Part II - Is anybody listening? If you were with me for part one of this two part blog (and if not, catch up here), I’ve been pondering on the increasingly important issue of how different generations communicate with each other in today’s social media / multimedia world – and why it’s so important for every business to realise that connecting and building sound relationships, both internally with colleagues and externally with clients, is vital for future success. For recruiters like Cedar, this is more than an academic exercise. We have jobs at every level, and candidates at every stage of their careers. Consequently, we find that a blanket approach to communicating with all and sundry simply does not work as well as it would have done a decade or so ago, when an email (or possibly a Mailshot if we were being creative) was all that was necessary. It seems to me that one of the biggest changes is that millennials (and Gen Z) are different from their forefathers in that the latter would rebel, tune in, drop out, etc. in their teenage and university years, but then fairly rapidly conform to most of the business mores of the day as they started their journey up the corporate career ladder. As UK PLC enjoys a period of high employment and talent scarcity, today’s newer generations are actually redefining corporate cultures rather than fitting into them. Moreover, “traditional businesses” are hearing, and responding to, the rallying calls - and to be clear, this is more that providing a dress-down culture and a table-tennis table. When it comes to the actual business of communicating, the first thing we have to understand is the media used by the different generations. Let’s start with the fact that millennials seem to dislike talking on the phone. This is a real phenomenon – and it’s already having an effect on society. Telecommunications giant O2 produced a study that showed that “telephone” apps on smartphones — i.e. using your phone to make real phone calls — are only the fifth-most-used app among the public. That said, it turns out that, despite the social media hype, old habits do die hard. Email is still very popular. A study from 2016 suggests that “nearly 68 percent of teens and 73 percent of Millennials said they prefer to receive communication from a business via email.” That’s comforting for those involved in email marketing, but however much we try, we can’t escape social media. 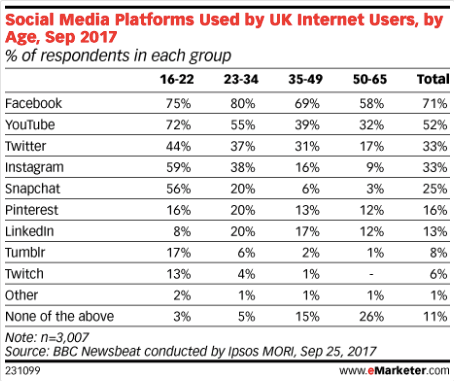 In 2017, an Ipsos Mori poll for the BBC showed that, much as you’d expect, Facebook and YouTube, in that order, dominate the UK social media landscape (see table on the left). Also as expected, the younger age groups are far more keen on Instagram and Snapchat, whereas LinkedIn (vital for recruiters) is more popular with (slightly) older people. In 2018, comms company We are Flint produced a study looking at UK and US social media demographics. This, by and large, confirmed what we saw in the BBC study, although there were some additional media included (notably WhatsApp and Facebook Messenger) and all the major platforms had increased their market penetration. Then there is text, which can also be used for marketing via SMS aggregators and online distributors. Crucially, 68% of (US) millennials admit to texting “a lot” on a daily basis, compared to 47% of their Gen X counterparts. Texts are instant and mobile, which means they can be read and exchanged at almost any time. They can be spontaneous, which is potentially dangerous, but they can also be thought out in advance. This ability to think things out beforehand is one of the strongest arguments advanced by younger generations for eschewing the phone and preferring email/text or similar written communication. Carefully crafted, concisely written communications where the meaning is clear are a very good way to build relationships and impress existing and potential customers. Finally, it’s important not to focus on only one audience or one means of communication. Don’t overheat about millennials and their attitude to the phone – and vice versa if you’re a millennial! Be aware that every generation sees the others through the prism of its own mindset. Acknowledge that, yes, different generations speak differently and use different (technological) channels of communication. But remember, as I stressed at the outset, we all have an inherent ability to connect and build the relationships which underpin our businesses and our careers. Rather than foster inter-generational bickering, use new channels to build rapport and relationships in new, different ways – with each generation learning from the others to the mutual benefit of the team, the business and the profits. And above all, remember that because it’s impossible to pick up facial expressions and the nuances of body language via a screen, nothing beats actual person to person communication. It is vital that we keep the human element in human interaction – so use all the tech platforms you want but never forget the importance of talking face-to-face.